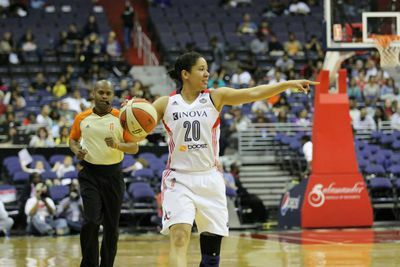 In her first game back, Kara Lawson scored 15 points for the Washington Mystics. Couple that with teammate, Ivory Latta, who scored 20 points, the duo was too much for the Minnesota Lynx. Scoring for the Mystics was spread out, with Ivory Latta leading the way with 20 points from off the bench. Kara Lawson would add 15, and Stefanie Dolson would add 12. Washington 8 threes by five different players, but zero fast break points. LaToya Sanders remained a force on defense, recording all five of the Mystics blocks. For the Lynx, Sylvia Fowles would lead the charge with 15 points and 11 rebounds. Lindsay Whalen would chip in 13 and 11 boards, and Maya Moore would add 12 and nine boards. The first quarter was fairly evenly matched offensively. Moore and Fowles would come out strong for Minnesota, combining for 14 of Minnesota’s first 25 points. Washington’s scoring was much more spread out to start the afternoon, but Emma Meesseman started off strong on offense, scoring six quick points. Meesseman has been struggling offensively since the All-Star break. The game may have been evenly matched in the beginning, but Washington would go on a 15-2 run with just over four minutes remaining in the second quarter to secure a nine-point lead heading into the half. Dolson, Sanders, Meesseman, Lawson, Latta and Tierra Ruffin-Pratt all contributed key field goals during the Mystics run. Minnesota would remain scoreless until the final four seconds of the quarter when Rebekkah Brunson would hit a four-foot jumper. The third quarter was a bit slower offensively for both teams. A critical play for Washington was also an unfortunate one, when Meesseman suffered an injury her shooting hand when she was unable to get a hand on a post pass. She would not return for the remainder of the game. Latta remained Washington’s offensive leader despite coming off the bench, while Fowles and Seimone Augustus would attempt to right the ship for Minnesota. The final two minutes of the quarter would remain scoreless for both teams as Washington held on to their ten-point lead, 64-54. Latta continued her dominance to start the fourth quarter, hitting a three-pointer and a jump shot to score Washington’s first five points of the quarter. Moore would hit a critical three for the Lynx that would narrow the Mystics lead back to ten and begin a 7-0 run for Minnesota. Brunson would hit two consecutive shots to cap the run. Lindsay Whalen and Brunson would each hit some key shots to try and put Minnesota back in the game, but four free throws by Ruffin-Pratt as well as good offensive rebounding would allow the Mystics to run enough time off the clock to secure a victory.